City Council officially ratified four draft bylaws (Raperda).
" 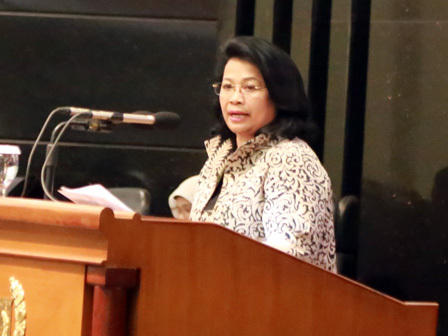 We hope Raperda can be applied optimally for Jakartans"
Ratification was approved after 77 council members who attended plenary meeting agreed with four Raperda discussion report which was announced by City Council's Bapemperda Deputy Head, Merry Hotma. That Raperda regulates about Industry, Market, Perumda Pasar Jaya, and RPJMD 2017-2022. "We hope Raperda can be applied optimally for Jakartans," mentioned Merry Hotma, Deputy Head of City Council's Bapemperda, Tuesday (4/10). She explained, Raperda accommodates inputs through fractions' general perspectives and inputs from commissions, stakeholders, academics, public representatives through public hearing (RPDU). He added, his side also gave 13 recommendation points thus Raperda can be functioned optimally. For example, plan to make industry in Jakarta becomes economic pillar, to create competitive modern public market, and equitable development. "Besides, we also hope after Raperda is ratified into Perda, it can be socialized continuously," she conveyed.